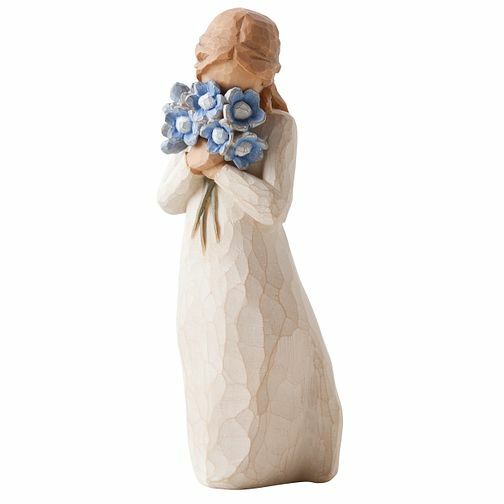 Willow Tree is an intimate line of figurative sculptures representing sentiments of love, closeness, healing, courage, hope - all the emotions we encounter in life. "Forget-me-not is a thinking of you piece, with a universal message. She represents timeless friendship and love that spans any distance. She's also another flower to add to the garden of colourful figures that include Sunshine, Beautiful Wishes, Surrounded by Love, Bloom and Happiness." - Susan Lordi. The item is made in resin and hand-painted with lead-free paint. Supplied in a branded gift box and a gift tag with sentiment 'Holding thoughts of you closely'. Willow Tree Forget Me Not Figurine is rated 5.0 out of 5 by 1.